A powerful Email address finder, Email address lookup, Email address collector, Email address extractor all in one software ! 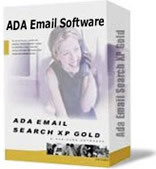 Ada Email Search XP Golden Bundle - searches and extracts email addresses both from Internet and local disk as you required. A perfect solution to establish your mail lists for Email marketing. It contains three powerful tools: AEAS, AEE and AEF. You can use them to get the cheapest and effective way to contact your target customers, an easy to use Email address finder, Email address lookup, Email address collector, Email address extractor. Ada Email Address Search XP searches for email addresses from the Internet. Ada Email Extractor XP searches for email addresses from your local disk. Ada Email Filter XP analyzes your email list files and deletes duplicates.